Due to the weather conditions the event has been postponed until further notice. Walkers Heath is pretty much the most active park in the whole of the West Midlands and it just keeps getting better. 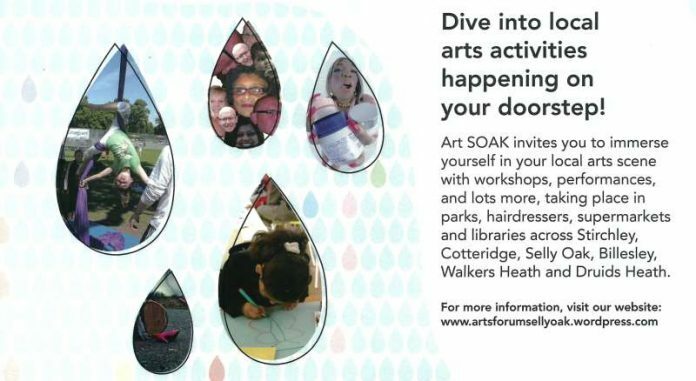 On Saturday 23’d March as part of the Arts Forum, Selly Oak’s Art Soak 2013 will be coming to Walkers Heath Park. Throughout the year the Arts Forum in Selly Oak provides a network for people to connect to via arts. Selly Oak Art Soak is an annual event in it’s second year which hosts a number of art activities in a two day period around the Selly Oak Ward. The 100 strong CBSO Selly Oak Vocal Community Choir will be performing at Walkers Heath Park as part of this event along side the parks award winning Be Active scheme. There will also be FREE refreshments and FREE face painting on the day. All activities are FREE as part of Be active outdoors and Arts Forum Selly Oak except Boot Camps (brought to you by In and Out Fitness) who operate on a donation basis: ‘Just pay what you feel they are worth’. All donations go to the charity Fields in Trust which protect playing fields like Walkers Heath Park from ever being built on. Buses 49, 35 stop nearby on Hillmeads Road and the 50 terminus is near by.